Do you have 10, 20 or more application windows open on the computer? Don’t feel like clicking close button on each application one by one? Get a life and close every damn application window in a single click or shot. 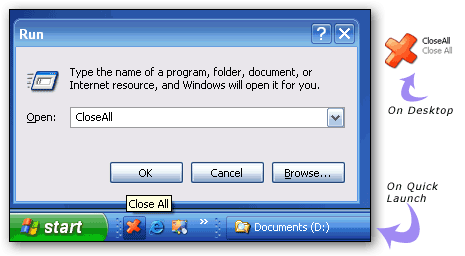 “Close All” is a small utility that closes every application on the computer to see clean desktop screen with no application window. It is an exe file, just drop this file on the desktop or specific folder. You can place shortcut link to this utility in quick launch or on the desktop. When destkop gets too cluttered with lots of application, just click Close All button. Keep the desktop clean and close applications without too many clicks (with just single click) with Close All utility.